The last wave we tracked is not Tropical Storm Cristobal and is moving NNE out to sea. But alas, this is the heart of hurricane season and there is another disturbance that bears watching. Current thinking on 97L 99% chance it fizzles or goes OTS. I’ll have another update tomorrow. As many of you know, one big topic this week has been the growing problem of “Hurricane Hypesters” (and winter storm hypesters) who make bogus forecasts with little to no merit simply for the pleasure of attracting attention. While few amateurs who do engage in harmful hype, their ‘forecasts’ can attract thousands of likes and shares which can cause widespread panic. One spectacular example of this happened this week when a Facebook page called ‘Weather Alert Central’ posted a bogus forecast saying the disturbance we have all been tracking would slam into the Gulf Coast as a major hurricane. 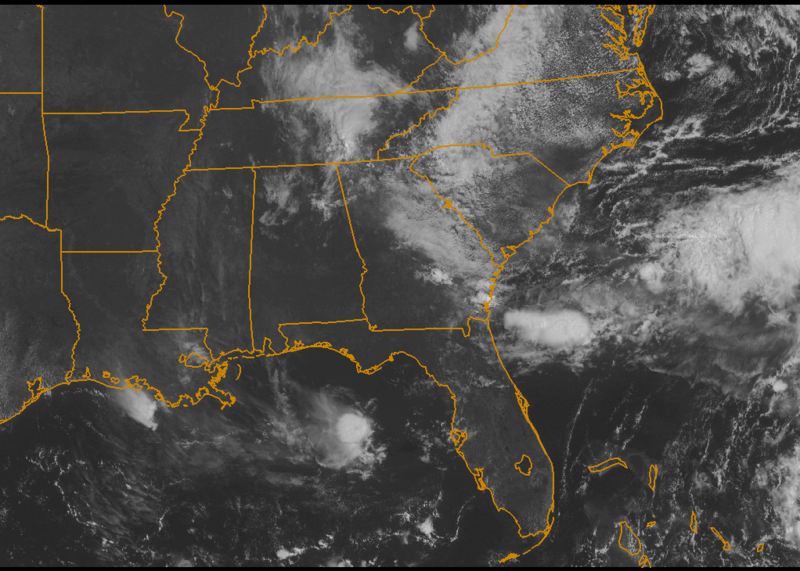 Well here we are, the timeframe they said the storm would ravage the Gulf states, and this is what we have today. While one computer model did vaguely hint at this solution, many in the weather community, including myself were very skeptical. 5 days ago, when the hype started, I made a post that discussed the potential dangers the storm could bring and many others, amateurs and pros sang songs to the same tune so to speak. Now I agree that some who fall into this category do exactly that (back in 6th grade, I came pretty close until Mike Hagget stepped in on twitter gave me a little more perspective), but the majority of us are devoted to squashing the hype. As a 13-year-old high school freshman, I’m not a professional met, nor do I claim to be. I’m just a ‘kid’ who loves the weather and wants to share the forecasts I work hard to make. Many of you know this about me but for those who don’t, I hope it doesn’t change how you see me or this site. Everything posted here is something I have put time, energy and thought into and I am really proud of what has come out of it. Thankfully, I have been lucky enough to have a Dad to told me to join twitter (yes, really!) and there I have met many people who have taught me a lot about weather and forecasting (Shoutout to Mike Hagget, Bernie Rayno, and Eric Fisher, among others, for being especially friendly and informative!) but I know there is still a long way to go. I know that there are a select few who give the amateur met group a bad name but my hope is that those who do hype realize that what they are doing is wrong and stop (wishful thinking, I know!) and also that those in the pro category both continue to put those fires out when they start (I know I’ll try too!) and also not criticize, but help out those of us who will one day be on TV/working at the NWS etc. What I’m trying to say is that despite the fact that some very few amateur forecasters hype up storms to drive ratings or site traffic etc, the vast majority of armchair mets do not fall into that category and it is unfair to criticize any and all of us who don’t have diplomas hanging on our walls (yet) or work at a big name institution. There are a collection of excellent articles about the most famous hypester, Kevin Martin, and his asinine effect on pro mets which I highly recommend reading, but to criticize all of us armchair mets is unfair. This will be my last post until September 2nd when school starts unless there is anything noteworthy to talk about. After a long and exciting evening yesterday, 96L finally closed off a center and was named TD 4. Early this morning, it earned TS status becoming Cristobal. An upper level trough is already starting to scoop up the storm and all forecasts point to a swift and painless recurve. Here is the official NHC track. If I were to take the time to make one, it would look almost identical. No other storms are forecast to form in the Atlantic Basin this week. I will have another post this afternoon about the Hurricane Hype wars from an amateurs perspective. Quick update today as nothing has really changed in the past 24 hours. 96L still has not made any discernible progress developing as it has spent most of the last 24 hours tangled with Hispaniola. Without a closed COC, the models are still useless as can be. 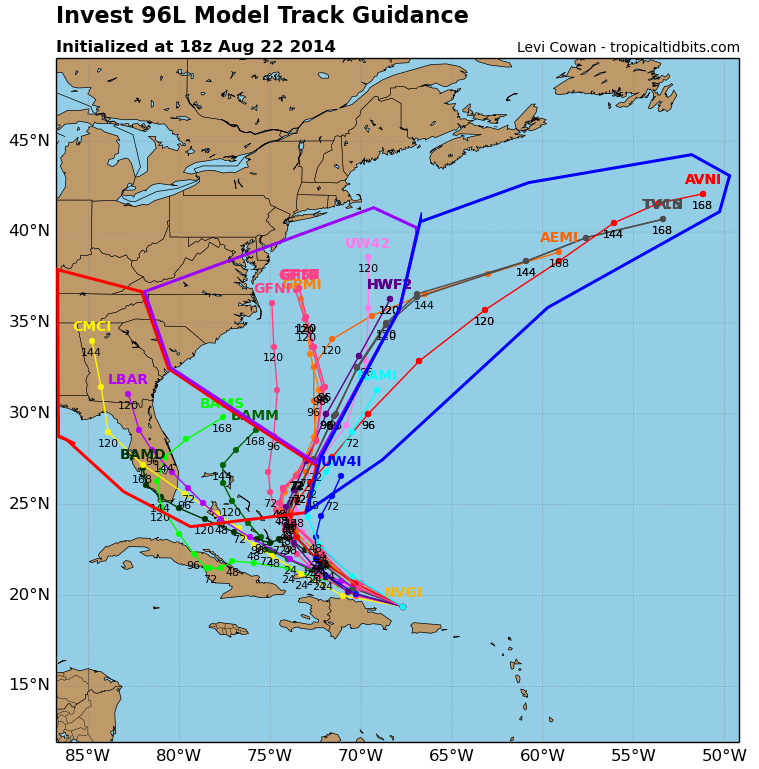 Here are the models… Solutions range from OTS to the GOM. I’ll have much more detail tomorrow when the storm is hopefully more organized. Our Caribbean disturbance is still chugging along without much of a center though it looks like a center may be trying to form in the Mona Passage between Puerto Rico and Hispaniola. 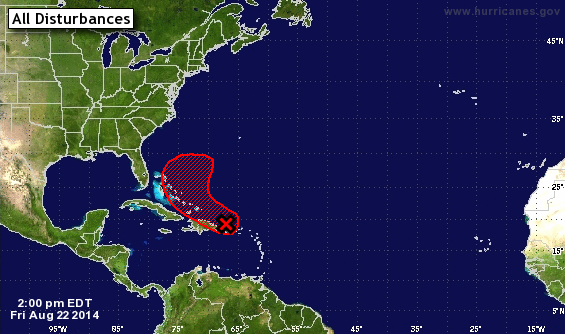 The latest update from the NHC gives 96L a 70% chance of developing in 48 hours and 80% is 120 hours. 2PM TWO update from the NHC. Despite the fact that it is still painfully disorganized, 96L has made one major improvement in the past 24 hours. We now have a sharp wind shift which is likely the beginning of a low level center (LLC) which means models should become more accurate now having a point to base their equations off of. 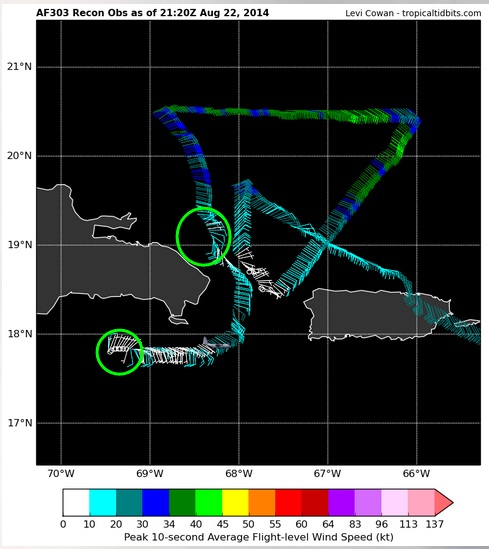 The Hurricane Hunters are out now investigating the system and their findings will be crucial. It seems as though there are 2 possible LLCs, one NE of the Dominican Republic and one S.
I have circled in Green the 2 possible LLCs. Which one dominates is anyone’s guess. As for myself, I think the northern area should make it out because the mountains of Hispaniola should rip the southern one to shreds. As for track, things have only gotten more complicated. Models are divided into 3 groups, one wants to take it into Florida, one wants it to start to recurve but suddenly stop and bank left into the Mid Atlantic, and one just takes it out to sea. Here is one model plot which shows, well, all the models. 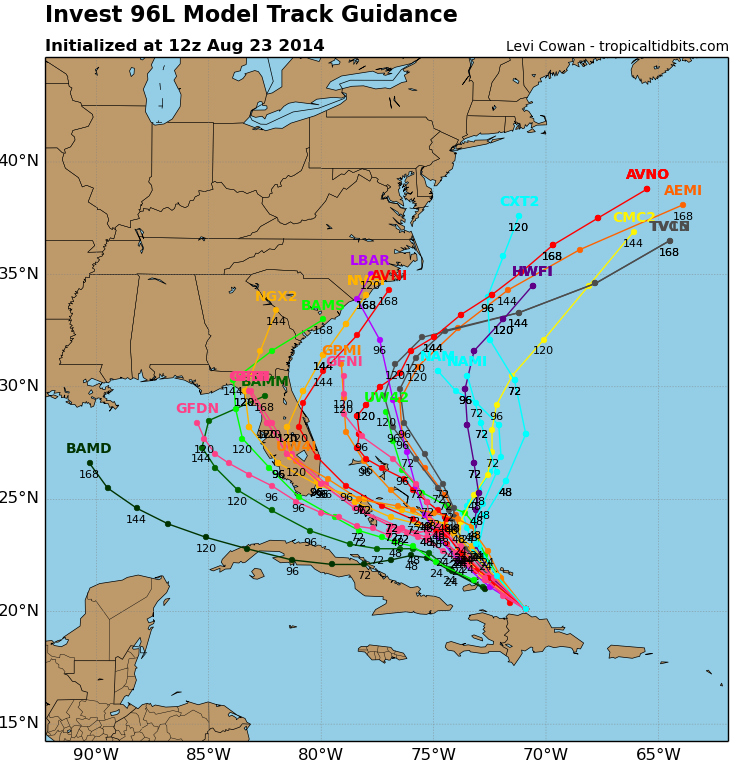 I have marked out the 3 possible tracks in separate colors with red representing a Floridian track, purple showing a possible left turn and blue a simple fish storm. I am still leaning towards an out to sea (OTS) solution however, there is more and more uncertainty in my mind as things unfold. The least likely track is that into the Mid Atlantic though it is worth mentioning as a possibility. I am still leaving intensity out because there is just too much we don’t know and I have no intention of causing hype or panic. If or when we have TD or TS, I will start intensity forecasts. Follow me on twitter for more updates through the evening @jacksillin. 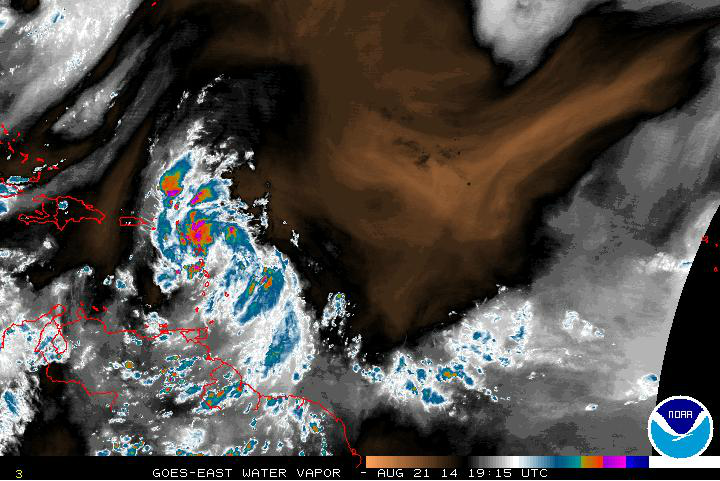 Our Caribbean disturbance 96L remains less than impressive this hour as it moves WNW at 10-15 mph. Its current location is roughly 275 miles east of the Lesser Antilles. In its 2PM update, the NHC gave it a 50% chance of development in the next two days and a 70% chance of development in 5 days. I agree 100% with those numbers. 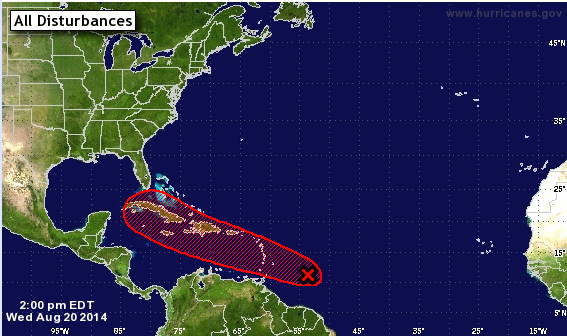 The latest NHC graphic shows the possibility of a northward track out to sea. Right now, 96L is still very disorganized. It has a decent appearance but no spin or any signs of a circulation. It’s heavy thunderstorms have fended off the dry air that plagued it earlier in the day but it still has a lot of work to do. As you can see here, the storm looks good but there is no circulation or any sign of spin so it has a long way to go. 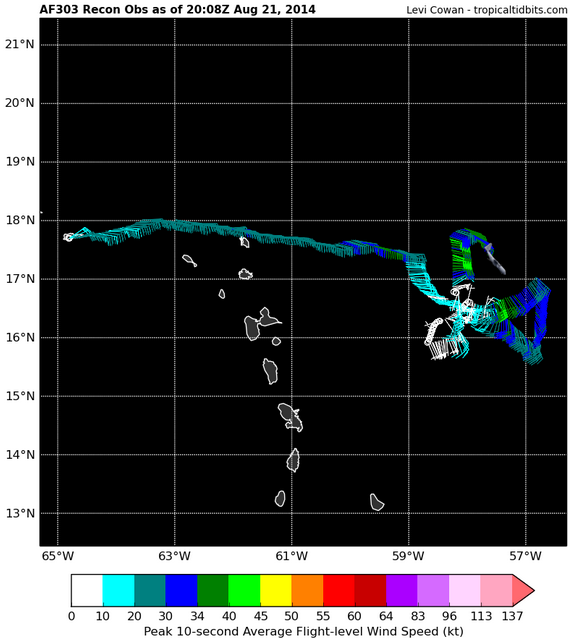 Hurricane Hunters are out there right now gathering data and so far they confirm the lack of circulation. Note that most of the winds are from the South or East and none from the North or West. 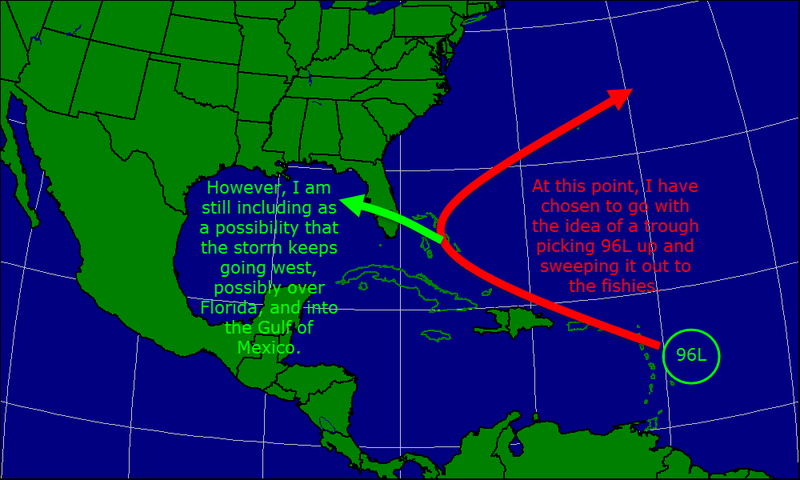 I posted on twitter this morning a graphic explaining why 96L has a very good chance of going out to sea. The reason is a trough in the upper atmosphere which could pick up 96L and take it on a ride to Europe. This is the most likely scenario in my mind because this trough is modeled to be unusually strong for this time of year and 96L is already north of model estimates. 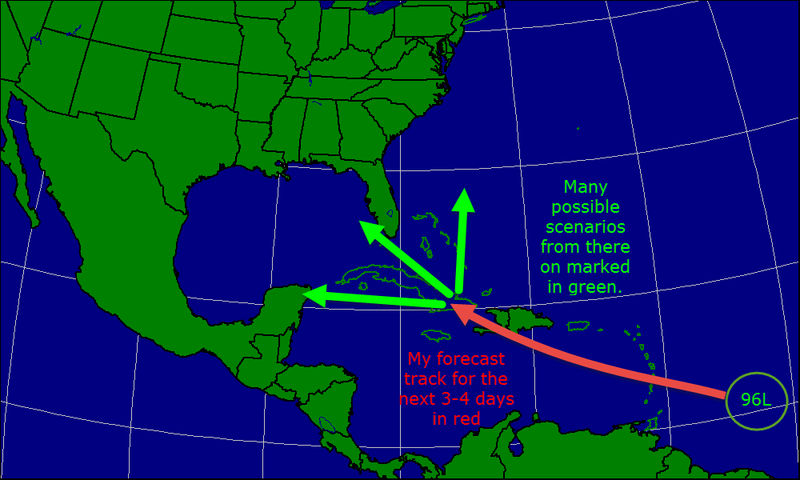 Here is the graphic I posted this morning showing the trough and one idea on 96L’s position this weekend. With that in mind, there is also the possibility that either 96L, the trough, or both are too weak to connect. In this scenario, 96L misses the ride to Europe and is still churning in the Bahamas. Should this happen, it is likely that 96L would drift West or WNW possibly hitting Florida before wandering into the GOM. 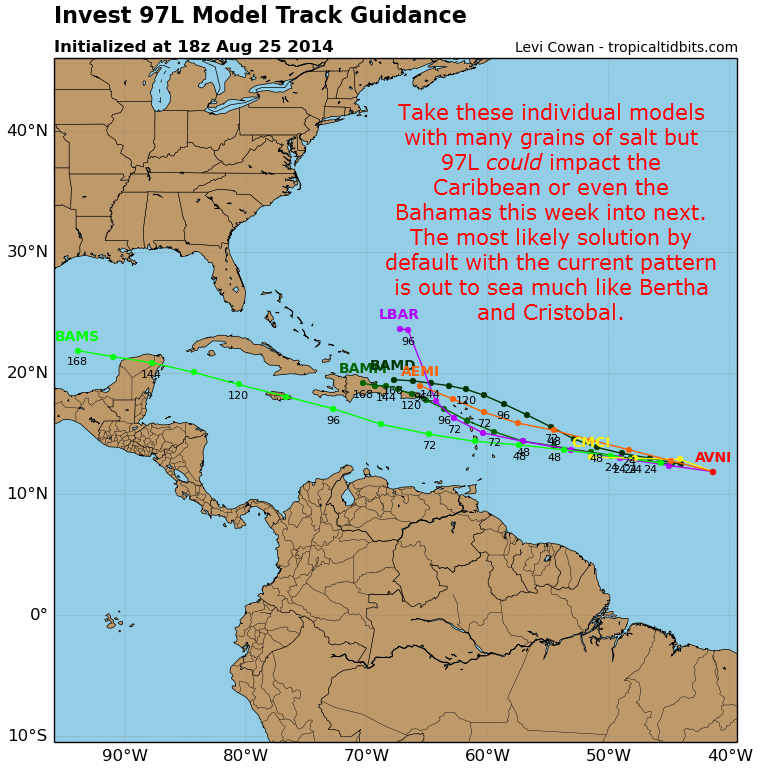 This would only work however if 96L was too weak to miss the connection. So no need to panic. The HWRF model shows this scenario happening except it follows the missed connection with a massive hurricane. So the track may be ok but the intensity is baloni. Here is my track forecast. I anticipate that 96L will be strong enough (moderate TS or stronger) to feel the trough and connect with it. Therefore, a ride to Europe is likely (dont worry Europe, by the time it gets to you, it will likely be nothing more than some breezy showers). However, I also included the possibility that it stays weak enough to skip the trough and wander over to Florida and maybe into the GOM. By this time though, another trough will be on the way and could sent the storm (or its remains) up the coast. The CMC is one model that shows this. It says that 96L will remain a wave all the way into Saturday night before intensifying into a tropical storm and making its first landfall in Southern Florida before turning North and making another landfall in Northern Florida. The CMC then shows the storm moving up the coast in a similar manner as Arthur did in June. Remember this is only a model. I showed this only to illustrate one possible scenario. Take it with a few grains (or maybe a whole packet) of salt. To put it all together, we have a very disorganized system with no signs of a circulation which is causing problems with the models and therefore indecision among forecasters. Right now, my best guess is that 96L will remain weak but slowly intensify just enough to feel the trough swinging down from the midwest. This should cause a sharp NE turn and a trip to Europe (plus lots of swell for America!). However, if it stays weak enough to miss the trough, it could end up in the Gulf. Our disturbance 96L has gained some organization last night and the National Hurricane Center has upped its odds of development. 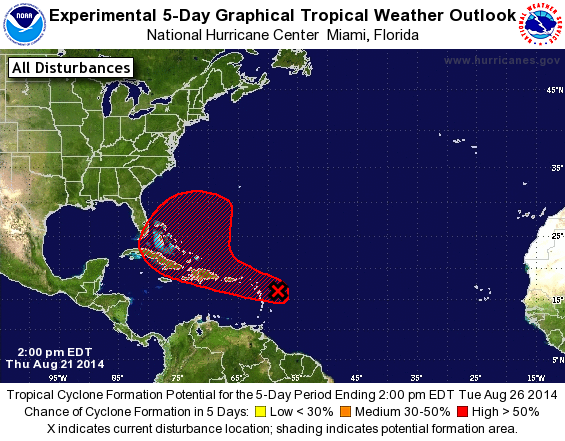 The NHC now puts the 5 day chance of development at 60%. This is the 2 PM update from the NHC. You may notice the northward shift in track from previous updates and model guidance reflects the same trend, to the north. This would also mean a weaker storm for a few reasons. The primary hinderance of development here would be land interaction. The mountains of Hispaniola reach over 10,000 feet into the sky which would do significant damage to a newly formed tropical cyclone. One other challenge 96L would have to face is much cooler SST’s and lower TCHP values (see yesterday’s post for an explanation). This means that any storm will have far less fuel to feed on and therefore a weaker system is likely. TCHP values for the tropical Atlantic. I marked 2 possible tracks on the map, one in red which would be a worst case scenario passing through the fuel laden Western Caribbean before entering the bath waters of the GOM. Right now, I don’t see this as being likely but it is something to keep an eye on. The more likely track which is marked in green has the storm moving over Hispaniola and maybe the eastern tip of Cuba before heading for Florida. The greatest threat here would be mudslides and flash flooding in Haiti and the storm would likely arrive in the Bahamas weak. 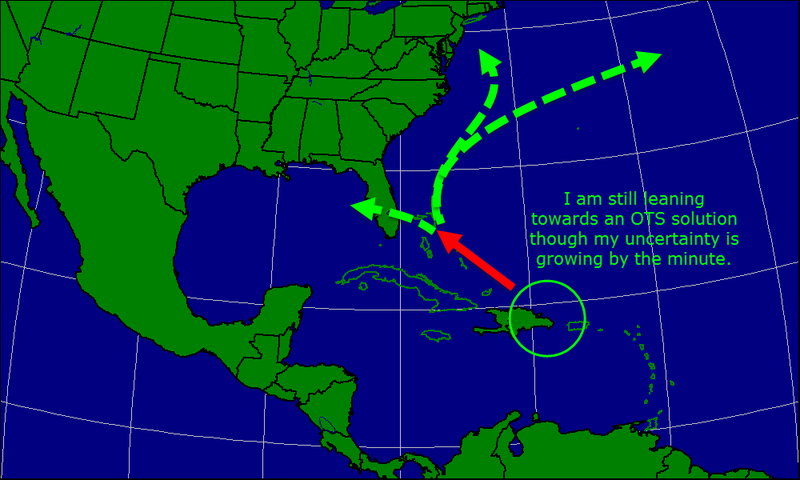 This map shows my rough idea of the track of 96L which is marked in red. This is to about 4 days out where the track really could go anywhere (it could go anywhere now but confidence is high enough to say that a track as shown in red is reasonably likely over the next 4 days). No I will not guess on intensity right now beyond saying a strong storm is unlikely. Our models really aren’t good enough now to make a reasonable guess as to how strong it is going to be. Hopefully someday we can say 10 days out with 100% certainty how strong a tropical cyclone will be but that day is not today. The environment 96L is currently in is only marginally favorable for development. There is more than enough dry air to contend with and a weakening upper level low is trying to inflict some shear on the system. However, to combat those effects, 96L has a strong upper level high pressure system over it which is continuing to help it enormously. 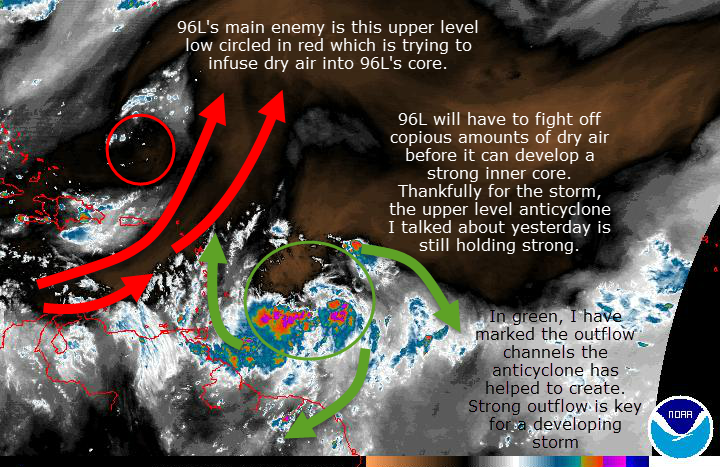 In this graphic I explain the environment surrounding 96L and some of the factors going for and against development. If you are like me and cant see those tiny letters, feel free to click on the image to enlarge it. 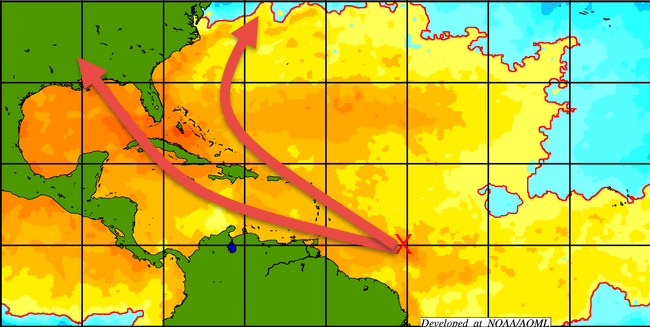 This map shows wind shear across the Atlantic Basin. 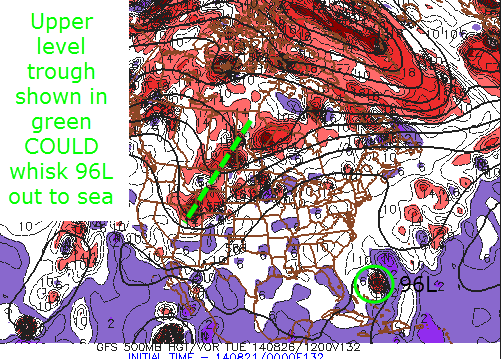 I have marked the upper level low in red, the high in blue and 96L in green. 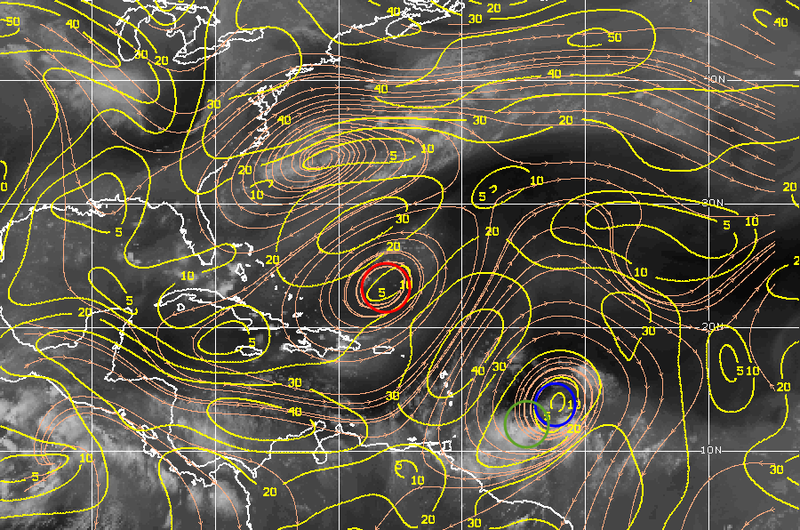 The high pressure center shown here will significantly help 96L develop. With all that in mind, my mentality with this storm remains unchanged for the most part. I think it is a threat and something to be watched closely but nothing to panic about. Please discount anyone who posts rouge model images without context. Remember, hurricane season means troll season so please know that any single model images showing big storms or otherwise, are irrelevant now. Hurricane Hunters are scheduled to investigate the storm tomorrow and if they do, the models will become a lot more reliable. There are too many people out there who post stuff like that just to get 15 minutes of attention and fame. Please don’t feed them. Ignore them and trust people who know what they are doing and realistically discuss the threat without hype. That is what I aim to do here: discuss the potential without causing panic. I will have updates all afternoon on twitter @jacksillin (after I mow the lawn 🙂 ) and I will plan post here again about this time tomorrow.